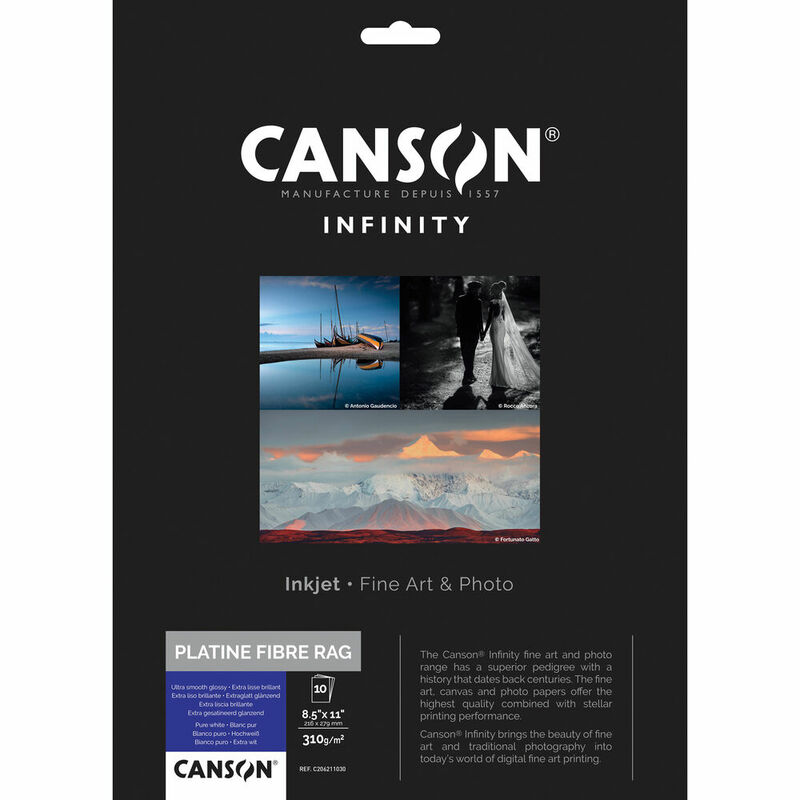 With an aesthetic and feel mimicking that of F-type smooth satin fiber paper from the darkroom, Platine Fibre Rag Paper from Canson Infinity sets a standard for printing in the digital age. Available here as a 10-pack of 8.5 x 11" sheets, the 100% cotton paper has the latest microporous coating along with the classic platinum/platine finish for bringing a darkroom look to digital printing. The 310 gsm paper also has a thickness of 15.6 mil and is rated with a whiteness of 89.12%. The paper is acid free and internally buffered for longevity and benefits from instant drying and a high water resistance to ensure no damage during handling. Box Dimensions (LxWxH) 12.8 x 9.0 x 0.2"
Platine Fibre Rag Paper (8.5 x 11", 10 Sheets) is rated 4.6 out of 5 by 14. Rated 4 out of 5 by sh_la_m from lovely for b&w just getting started with this paper, but it seems very nice for b&w on the epson 3800. Similar to Hahnemuhle Fine Art Pearl but with slightly smoother texture. Similar paper color. Perhaps slightly more contrast with manufacturer-supplied icc profile; it is suggested to leave black point compensation unchecked, so perhaps that is the cause. Very rich results. Haven't used it for color yet. A good paper to try, if you haven't yet! Rated 4 out of 5 by Stoneystone 68 from Platine Fibre Rag An excellent paper for both BW and color inkjet printing. I am printing on an Epson R1900, and getting excellent results. The weight of and the finish on the paper are both very nice, and the richness of the printing tones is spectacular. Rated 4 out of 5 by Anonymous from Great looking prints Great looking prints, the paper is like a shiny Matte! Naturally, we'll see how it lasts in a few years...good price. Rated 4 out of 5 by Nesto from Great paper! I just got this and made a few prints, with great results. It was done on a dye printer and custom color profile. It has a nice, slight sheen to it and love the thickness/weight of the paper. It has no optical brightness and has a warmer tint to it because of it. I've found so far that flesh tones and yellows appear warmer because of it. I can't wait to see how a B&W print turns out! Rated 5 out of 5 by nflickin from Perfect! I use this for my photography and I love the way my photographs turn out on the paper. I have showed some of my friends and they the paper helps give a professional quality look to my print. Rated 4 out of 5 by Bob from Nice paper, good color This is very nice paper with a very good color gamut. It has a nice slightly luster surface that works well with the glossy inks in my Epson printer. It's a good archival heavy paper for fine art photos. Since it's on the expensive side, I wouldn't use it for everyday photos. Rated 5 out of 5 by The Tall guy behind the camera from Great for a portable portfolio I use the paper to update my portfolio, It is inexpensive and a great paper for both black&white prints and colored prints. The paper has a nice weight to it. Giving you the sense that you are really picking up a nice piece of artwork. Rated 4 out of 5 by Hellion from Great print Quality! I like most Canson Infinity papers, and this one was great for printing however it was a bit hard to trim, it got very fuzzy around the edges when cut.